Dale Druckrey was born on May 31st, 1933 in Shawano, WI and went to Bonduel High School then UW-Madison. He worked as a social worker for many years in Menominee, WI. On November 30th, 2010 he passed away in a house fire. He was 77 years old. Dale’s obituary describes him as an avid outdoorsman who enjoyed hunting and trout fishing. He was proactive in environmental and conservation issues as well as an active member for several organizations including numerous Trout Unlimited chapters. 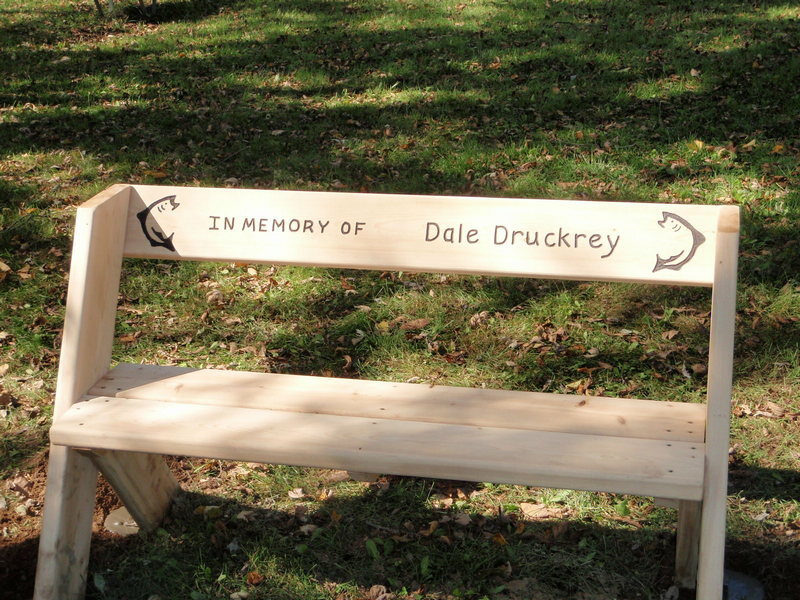 While Dale’s unexpected passing occurred almost 9 years ago, his environmental and conservation impact remains. According to Bryan Pierce’s article”Loss of a River Champion” (Northwoods Land Trust winter 2010 newsletter)…Dale had an undeveloped lot in a subdivision in Minoqua that he sold. The proceeds were split between the Natural Resources Foundation, River Alliance of Wisconsin, NWLT and Trout Unlimited. As a result of Dale’s generosity Green Bay Trout Unlimited was to receive $2,075.00 each year for 10 years. GBTU work project chair and Wisconsin state membership chair, Paul Kruse, shared his feelings explaining how Dale seldom missed a GBTU work project day, meeting, chapter picnic, banquet and Conservation Lobby Day. Paul was GBTU chapter President when Dale passed. At that time the chapter purchased a bench in his memory (it is the one pictured in this article). According to Paul, the bench was placed in the Village of Pulcifer along the Oconto River. This spot was chosen because the Oconto was Dale’s favorite river. We also wanted to make sure it was placed in a location with relatively well-used public access that was close to his home and family. I personally had the pleasure of meeting Dale at a work project when I first joined TU. I had brought along a friend (Tim Maher) who also took one of his friends. I will never forget how friendly Dale was to the three of us. We were total strangers to the what was going on and he made us immediately feel like part of the group. I wish I had the opportunity to know him more. In my time as a chapter board member and then as chapter President, I always try to do my best for the chapters’ members, stakeholders, donors and more. I constantly remind myself of the annual donation and legacy Dale left behind. I felt it was important to remind those of us who knew Dale about his past and current impact on the GBTU and the natural resources we, and our fellow conservation groups, continue to defend. His generosity is an important story to share with those who did not know him as well. Thank You Dale for all you did for the coldwater resources of Northeast Wisconsin ! !